Did you know that in the jewellery industry we have specific names for the various lengths of chains and necklaces? Well now you do and buying jewellery chains online will be easier for you knowing the terms and size categories for you next purchase and how it will fit you personally. Below and in the image above are the 5 most popular chain lengths, names and sizes in centimetres (inches below) along with a little more detail to help with your jewellery education and chain selection. 40 centimetres or 16 inches, Choker necklaces sit just above your collarbones and emphasise your neckline. Choker length chains will lie snugly around the middle of the neck and they work well with v-neck clothing, boat necks tops and off the shoulder styles. As Choker length chains lay perfectly around the base of the neck, a simple choker necklace will match any outfit from formal to casual and nearly every neckline. The Choker length is most flattering for slim to medium build women and men. For those with broader shoulders or a full neck the princess length fits like a choker chain. 45 centimetres or 18 inches, Princess length necklaces hang just over or on your collarbone, below your throat and are the most common length of chain. You can wear the princess length as a contrast to low, plunging necklines however, they are best suited to clothing with crew and high necklines. These are the best length of jewellery chain for supporting an elegant pendant. 60 centimetres or 24 inches, Matinee necklaces are quite a common sight these days often with larger pendants for show as they hang mid way between your sternum and collarbones. Matinee length chains are suitable for casual as well as business attire making them an easy choice for daily use. Matinee lengths will usually hit right at or below the V in V-neck clothing and are also a good length for charms and pendants as they are easy to wear over a crew neck sweater. This length is ideal for casual or even business attire, and will usually hit right at or below the V in a V-neck. This is also a good length for charms and pendants and is easy to wear over a crew neck. 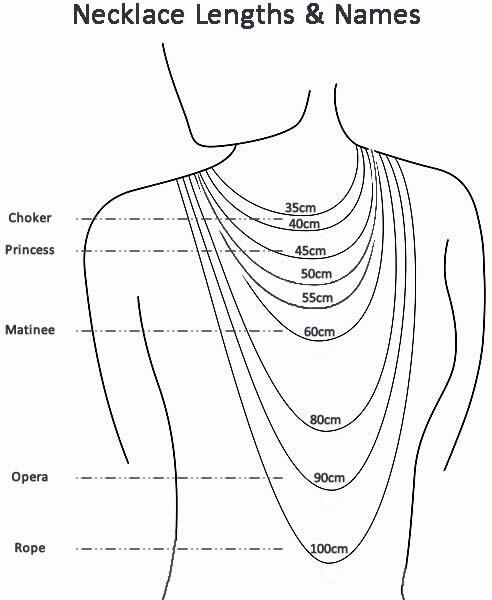 90 centimetres or 35 inches, As the name suggests, Opera length chains derive from the 20's and 30's when it was popular to wear long necklaces to the opera. Opera length necklaces hang over your blouse, dress or shirt for dramatic effect so have to be considered in relation to what you're wearing, especially if it's a chain with a pendant. The length of an Opera size chain means it can fit over your head so can be a good choice if you like to take your jewelry on and off often without fiddling around with the various styles of chain clasps. 100 centimetres or 39 inches, Rope length necklaces hang below the bosom and fall as far as the navel. The length is usually worn as a beaded necklace or simply as a chain and are very common with pearl strands. Rope length jewellery chains can be worn as a single strand or you can double them for an elegant, 50 centimetre necklace. View our beautiful collection of sterling silver chains.